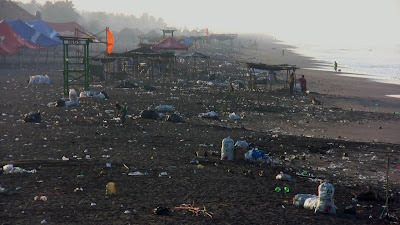 Surfers Without Borders: Plastic, Plastic, Everywhere- Does anybody care??? Plastic, Plastic, Everywhere- Does anybody care??? 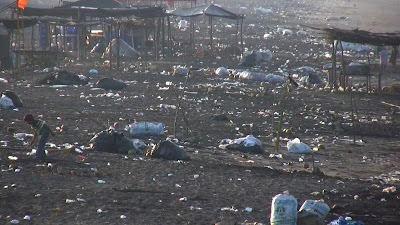 After returning to Mexico and driving further south, we have realized that the most pressing issue for the ocean and humanity is not human waste or chemical pollution, but plastic waste. Plastic has become the number one pollutant in the open ocean, outnumbering plankton 6 to 1 in the North Pacific Gyre (source: Algalita Marine Research Foundation). Plastic debris in the ocean is not only unsightly, it is harmful to marine life. Birds, fish, and turtles consume the plastic because it resembles food. Plastic does not bio-degrade, it photo-degrades, that means it breaks into smaller and smaller pieces. It breaks down to the point at which even plankton consume it, as it slowly sinks to the bottom. Don't trash this wave, please! Aubrey setting up. Traveling through Central America, the story is no different: in fact it is the worst we have seen. Local trash collection is often unsatisfactory or completely absent, because it is either voluntary or costs money. 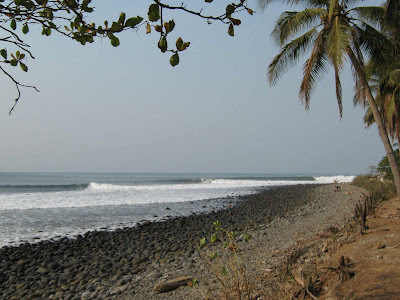 At Playa Zonte in El Salvador, we saw a local man throw a bag of trash onto the beach. We explained to him the problem with plastic in the ocean. Unfortunately, he viewed plastic and leaves in the same category, as “basura” (trash). The local practice is to throw everything into the ocean. Currents drag the trash further out to sea, into the Gyre. As a result, the volume of trash is not obvious on the coast. 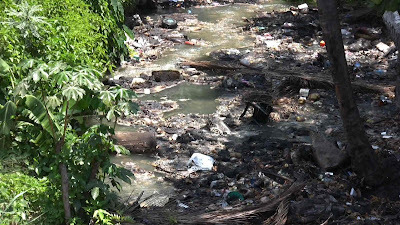 In El Salvador, many people cannot afford trash collection, or are unwilling to pay. They believe that the government should take care of it. Because of this, most trash is either burned or thrown to the wayside. Education is a huge factor- the people do not see why plastic pollution is a problem. It has yet to affect them, and their health or their pocketbooks. We are starting by educating the children. Aubrey has been reading a children’s book by Joel Harper, “All The Way to the Ocean”, to local kids. The book explains what trash does when it reaches the sea. 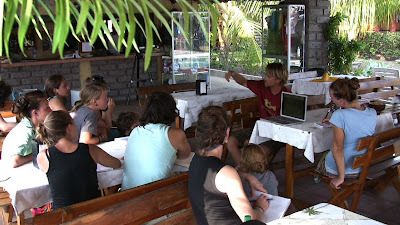 Loren also taught a group of girls enrolled in The Traveling School and Introduction to Permaculture. They were all excited at the opportunity to create careers in the environmental field. We did see signs of progress in La Libertad. 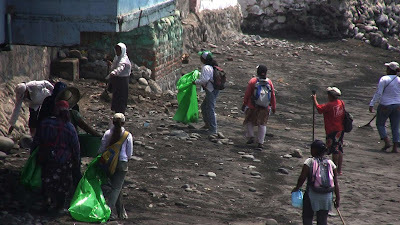 A group of local women were picking up trash along Playa La Paz at Punta Roca. This is a step in the right direction, but a small band-aid at best. We need to change our thinking about plastic, and see it as a resource. If plastic were worth money, not a single piece would be left on any beach. New technologies are here to use waste plastic. 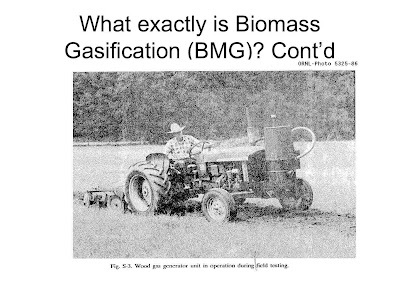 Gasification is not new, though the burning of waste plastic for electricity generation is a new idea. An Australian company named Ozmotech has created a generator to burn waste plastic at high heat to turn a steam turbine, with no exhaust. Also, a woman in India has figured out how to turn waste plastic of all categories into fuel and high viscosity oil. What if you could clean the beach to run your car! Plastic is made from petroleum after all. Why not return it and burn it! 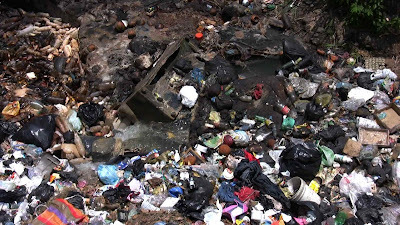 We can solve two problems with one solution- plastic pollution and the energy crisis. 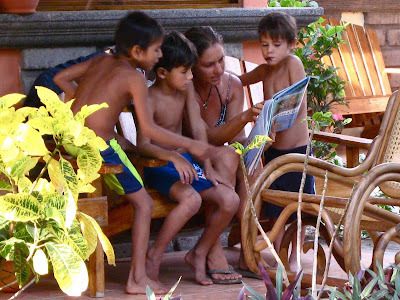 We are heading south to Nicargua to see what we can find there. This will be our final destination, and we will turn around retracing our steps and revisiting friends we met and projects we started along the way. An hour and a half after Professor Alka Zadgaonkar put a kilo of colourful shredded plastic bits into a tall reactor and fractionally distilled the outcome, she asks me to come over and take a look. A pale yellow liquid, the colour of evening light, has collected inside a beaker. It smells vaguely like petrol and, like gasoline, is fleetingly cool to the touch. An employee at her plant in the industrial Buty Layout in Nagpur transfers the liquid into a plastic bottle, unhooks a Kawasaki Caliber’s fuel line and plunges it into the bottle. The shy, unassuming 44-year-old, who heads the department of chemistry at Nagpur’s GH Raisoni College of Engineering, asks me to go ahead and ride the bike. With the employee riding pillion and holding the bottle with the fuel, I putter about the industrial park, trying to discern differences between petrol and Zadgaonkar’s plastic fuel. But save for a slight rough edge to the latter, there isn’t any. This is as good as petrol.